3.5 How Long Should You Spend in a Home Steam Sauna? 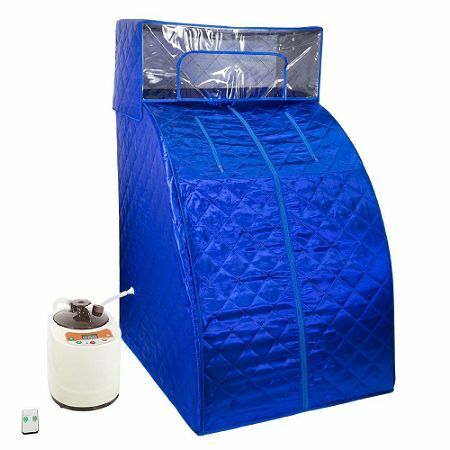 After taking a deep dive into the home steam sauna market, I’ve found that the best home steam sauna is the SUNCOO portable steam sauna. 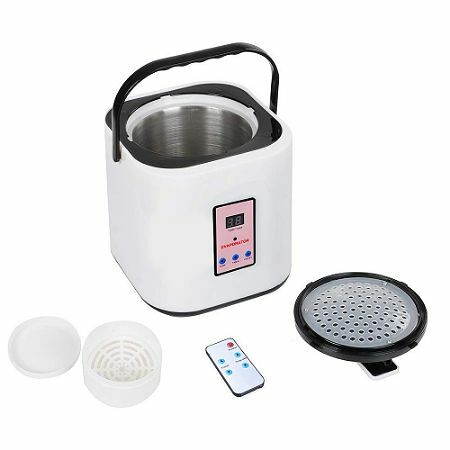 Not only is it the best priced, but it has a few features that contribute directly to an improved experience: namely, its five-layer heat preservation system and simple assembly. The insulation helps the sauna get hotter quicker and stay hot while inside. 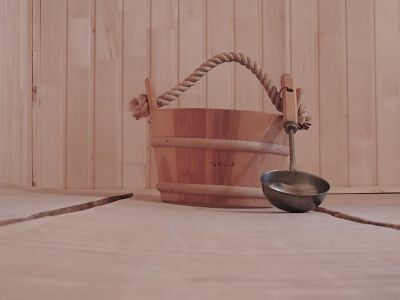 It also comes with a wooden foot massager pad, as well as all the standard features common among portable steam saunas. For more information on the SUNCOO, see below. The runner-up to SUNCOO’s home steam sauna is Durherm’s portable folding home steam sauna. With a timer allowing up to 60 minutes of 800W energy, this sauna is capable of steam up to 113F, or 45C. 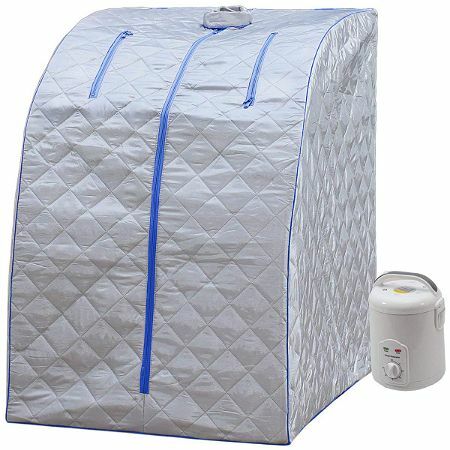 It’s compact, quick to set up, and easy to use, making it an excellent runner-up best portable steam sauna. For details on the Durherm, see below. Home steam saunas come with a host of various benefits, but mainly they are great for relaxation. Although they don’t work any kinds of miracles, they do help the body in numerous ways. These ways include relief from joint and muscle pains, improved circulation, healthier skin and skin tone, and even burning a few calories. But a steam sauna won’t work miracles, nor will it cure all that ails you. It’s easy to find some crazy outlandish claims regarding the efficacy of saunas in terms of weight loss, longevity, and even cancer prevention, but virtually all of the studies regarding these benefits are pretty sketchy and preliminary. 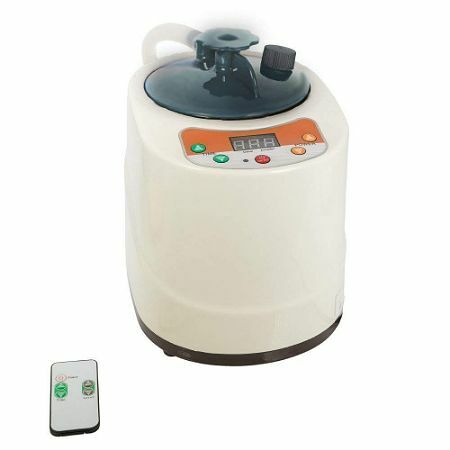 The best thing to do is to largely ignore them, and if you like the idea of a pleasant sit in a hot sauna for a little while, you’ll love a portable steam sauna. If you’re going into it hoping it will cure your cancer, well. It probably won’t do that. A sauna can be a great time to reconnect with your partner, as well — if you aim for a two-person infrared sauna. Let’s look at some of the somewhat concrete benefits these saunas can offer, as well as a few studies. Traditional saunas use dry heat, typically wood or charcoal. Steam rooms, on the other hand, use heated water to provide the heat to the space. The end result of these two processes is similar — the body heats up — but traditional saunas do this in a dry fashion, while steam rooms and portable home steam saunas produce a wet heat. Traditional saunas are usually lower humidity and higher temperature. Of course, in many saunas, users can add steam when desired, but the steam is not the source of the heat. All of the science around steam saunas, infrared saunas, and saunas, in general, is super preliminary, and all of these claims should be taken with major caveats. The bottom line is that a steam sauna will not be the answer to your medical needs, but it will provide a place of comfort, rejuvenation, and (for most users) a great deal of pleasure and good feelings. Buy your sauna due to these reasons, not due to any ultra-preliminary scientific claims. Regardless, let’s look at a few of the preliminary studies here. Steam saunas will make you sweat. This will cause the body to expel water, which will naturally lower the body weight. Steam saunas will not likely burn significant fat, which is what most people who intend to lose weight want to do. And of course, once you’re done the sauna, you’ll probably want to drink a fair amount of water to rehydrate, and what will the impact of that be? Adding water weight! If you’re looking to lose weight, a steam sauna will likely not be of much help. Stick to dietary changes and exercise. A small study of 20 individuals found that a steam sauna session, after a workout, helps to loosen joints and soothe muscles that have been strained during exercise. This can help aid recovery and get you back on track more quickly. Of course, this study is quite preliminary. A very small study of 10 older individuals found that steam saunas improved circulation when combined with vibrating pads. This is clearly very preliminary but is interesting nonetheless. Many find that spending time in a sauna helps to reduce stress, and I agree. Of course, I haven’t seen any evidence that the actual mechanism of steam on the body actually reduces stress, but rather the act of getting into a sauna, giving the mind a break, taking time off from the phone and from daily life, and just letting the soul recover. These are what help to reduce stress. For this reason, it’s best to put the phone down when using the sauna if you want to get the benefits from it. Focus on yourself, not on Instagram. And if you really want to reduce stress and anxiety, consider trying some Kava, as it is quite effective. You can find studies claiming that saunas will purge “toxins” from the body. This is true on one level: if you sweat, your body will expel water, and in that water will be some amount of lead, mercury, and other heavy metals. But the amounts released are minuscule. If you actually have lead or mercury poisoning, you need to see a doctor, not a steam sauna! All of this toxin purging stuff is nonsense. After you start using your steam sauna regularly, you’ll find that you sweat a lot while inside. There’s a lot of moisture going on in there, between the steam machine and the body’s sweat! All that moisture can breed bacteria and pathogens that can make you ill if you’re not careful. You should be regularly cleaning your steam sauna. Generally, this just involves using towels to wipe up as much water as possible, and periodically spraying down the sauna tent and all other exposed materials with Lysol or similar antibacterial cleaner. Be sure to stay up on the cleaning, as you want to use your steam sauna as part of a healthy lifestyle, not as part of a process to illness! You can add essential oils to most of the home steam spas on our list. Essential oils are concentrated liquid extracts that smell amazing and may have some beneficial properties. Lavender oil, for example, smells amazing and offers many potential benefits. 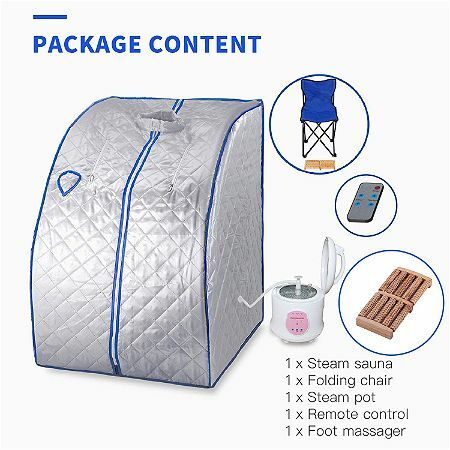 A Home Steam Spa essentially consists of a tent that you sit in, and a little steamer that looks an awful lot like a rice cooker (but we wouldn’t suggest that you cook rice during your sauna session!). 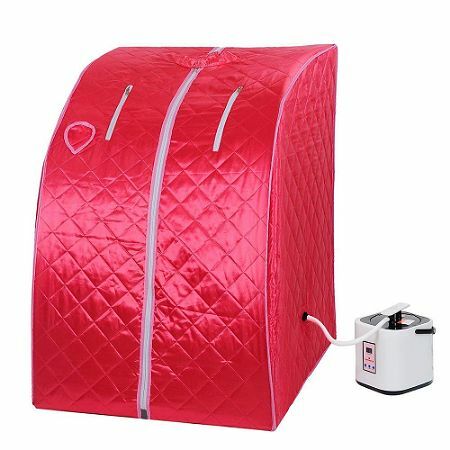 Portable steam saunas, unlike portable infrared saunas, are compatible with essential oils. See here to find the best sauna essential oils. How Long Should You Spend in a Home Steam Sauna? Most of the saunas on our list have a timer that maxes out at 60 minutes. They typically take 10-15 minutes to produce steam once they’re turned on, which leaves about 45 minutes of steam time for a session. This is a pretty good target, though it might be a bit long for some, especially starting out. Always listen to your body, and if you start to feel questionable, leave the sauna immediately. Be sure to rehydrate with water after you’re done the sauna. If you’re looking to relax after a long day’s work or just set up a comfortable spot for you to sit in for a few minutes while reading, I’ve reviewed four of the top at-home steam saunas below. You’ll find these to be pretty similar to each other, but each comes with a few different features and benefits. If you haven’t considered a portable infrared sauna, you should certainly check those out as well. Also, the chairs that come with portable saunas are very much in the folding camping chair style and aren’t particularly comfortable or calming over the long term. Consider picking up a sauna chair if you find that you’re using your sauna a lot! In this section, we’ll start with a comparison table to get oriented, and then move info reviews of the four saunas. Finally, I’ll wrap up with conclusions. A simple at-home steam sauna that can easily fit in most rooms given its compact size. 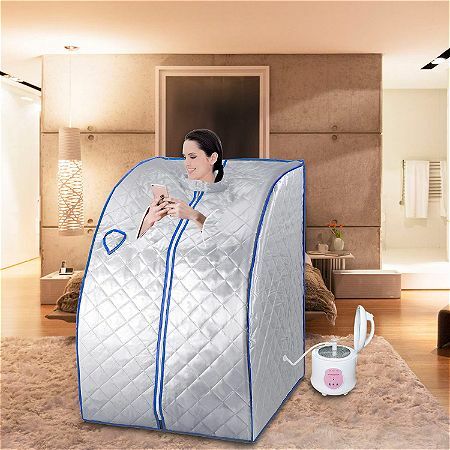 The AW Portable Large Steam Sauna is a complete package steam sauna with a sauna box, folding chair, steam heater, and remote. It’s pretty easy to use and does a great job of quickly warming you up with powerful steam heat. Functionally, this sauna is very similar to the others on our list: you climb inside, typically naked or with a bathing suit on. You then zip yourself up inside while leaving your head out. If you so choose, there are two zippers which allow your hands to leave the sauna. This allows you to do other things, such as reading or using your phone (try to avoid using your phone), while retaining the benefits and relaxation of the sauna. One of the big advantages of this sauna over some of the others on our list is that it is relatively easy to assemble. You can get it set up and working pretty quickly. Some of the other saunas on the list are not so easy. While it is easy to assemble, it’s worth noting that it may not be as easy to disassemble – so if you are planning on moving this around often, you still get headaches. Cleaning wise, you’ll want to make sure that you open this up after each use. A gentle wipe down is recommended along all the interior surfaces. You may use a disinfectant like Lysol if you choose, but that may not be needed after every single use. If you don’t clean it with a disinfectant after every use, it would be beneficial to periodically do so, depending on how much you use it. During use, you’ll want to keep a towel on the floor to absorb wetness and perhaps another one nearby to catch sweat. You’ll be sweating up a storm pretty quickly, and will feel rejuvenated after a short stint of 30 or so minutes in the AW Portable Sauna. This is a simple at-home sauna that offers basic features like the zippers for your hands, but it has no outstanding qualities to separate it from the remainder of the saunas that we are about to review. It’s certainly not a bad purchase and will do its job, but it’s not outstanding, either. Preserving heat is what the SUNCOO portable home steam sauna is all about! And it accomplishes that with its 5-layer system consisting of a heat preservation board and high-quality thermal insulation material. Five-layer system to ensure heat preservation: layers of thermal insulation, heat preservation board, etc. For warranty information, contact SUNCOO directly on Amazon. The SUNCOO has virtually all of the same basic features as the AW Sauna above but has a better insulation system, higher power, and a foot massager that acts to keep your feet up off the floor, and away from the damp towel. Functionally speaking, this sauna does a better job than all the rest at doing what it’s supposed to do: reaching high temperatures and making you sweat. The five-layer heat preservation system helps to get the temperature as high as almost 150F. This sauna comes with an adjustable power source, which allows you to choose from a range of 200W to 1000W. This can be helpful in allowing you to pick a temperature that’s right for the occasion as well as what you are capable of handling. Often it’s best to crank it up to full power a couple of minutes before you step in. Then step in and stay inside for a few minutes at that temp, and proceed to drop the temperature to a cooler spot as needed. In terms of the frame design, one fairly minor issue with the SUNCOO sauna is that there is a crossbar for support and stability near the entrance of where you get in and out. This can make it a bit more difficult for maneuvering into the sauna, but it’s largely an inconvenience. Like the other saunas on our list, the SUNCOO also has two zippers which allow you to use your hands freely outside of the sauna while in it. Outside of it is also a non-slip pocket, perfect for things like a remote control or your phone should you chose to retreat back into the sauna completely. That said, do your best to avoid using your phone in the sauna, and instead use the time to meditate, relax, read a book, or otherwise disengage from the online world. 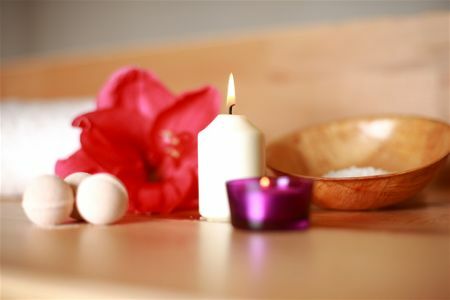 To increase the relaxation and spa-atmosphere, considering adding an essential oil for a more relaxing experience, such as eucalyptus. SUNCOO’s steam sauna is a great choice, as it is overall easy to assemble, has additional functionality over other similar saunas, and achieves its core task of steaming you up quite well. Its overall light weight allows it to be easily transported to different locations of the house as needed. The SUNCOO is great quality and it is positioned at a great price point. It’s the best home steam sauna around! This personal sauna is easy to assemble and disassemble and can be set up for up to 60 minutes of use at a time with its powerful 800-watt steam generator. For warranty information, contact Durhem directly on Amazon. Coming in at the smallest physical size out of all the saunas, this is perfect for those who don’t have a lot of space to set up, and who have relatively small body types. Its overall dimensions are 28 x 33 x 42 inches, allowing it to fit in smaller spaces as needed. It does need a few additional accessories, as a seat is not included with this one. However, the included seats in these saunas are all not great, and your best bet is to get a sauna chair instead. 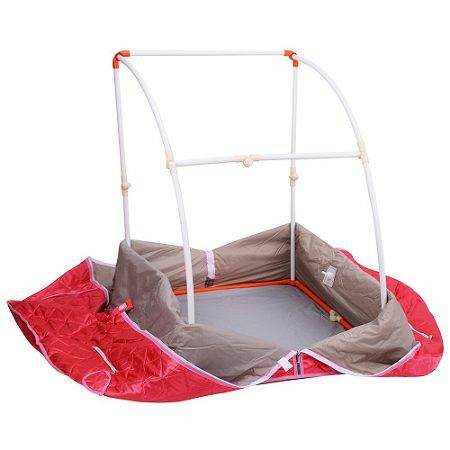 Assembly is pretty easy and includes the foldable sauna set, a set of PVC tubes, the steam generator, steam hose, and manual (which is found here). Functionally, it reaches temperatures of about 113F. 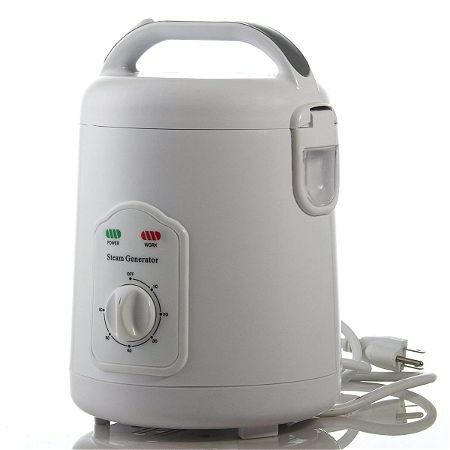 It uses an 800W steam generator and can be set to run up to 60 minutes at a time. There is a zipper for each hand so that you may use them outside of the sauna while you remain in. As we’ve said, try to avoid using your phone in the sauna. Not because it’s dangerous, but rather because you’ll get the most from the experience if you use it as a time to retreat and relax. When it comes to cleaning, approach it as you would with any at home sauna – it must air dry after each use as well as being wiped down. Whether or not you choose to disinfect it each time is up to you, but it should be done regularly to prevent the spread of germs and growth of mold. Where does this sauna stack up compared to our other 3 in the list? I place it right behind SUNCOO’s portable sauna. It does not have some of the extra core functionality features that you see in SUNCOO’s such as the additional insulation, but it is also without flaws that some of the other saunas might have, such as being difficult to disassemble. It does come in at a slightly higher price point and does not include a chair. Both of these are at least somewhat negative aspects of this sauna. This portable sauna with dual zipper openings makes it easy to get in and out and includes a head zipper for facial rejuvenation. For warranty information, contact WYZworks directly on Amazon. WYZwork’s at home sauna has a few additional features compared to others on the list. First, it comes with a built-in sensor which will automatically turn it off when it detects there is no water in the steamer. This can help you save energy and be more efficient, as well as knowing when it’s time to refill if you want to stay in longer. Next, it is the only sauna we’ve reviewed which comes with a head cover, allowing you to get the same benefits for your face as for the rest of your body. The head cover easily zips to the top of the sauna and allows the steam to rise up and hit your face as well. However, many find the head cover to be nearly useless. It’s sized awkwardly, and the materials are rather poor for the head cover. Most find that they don’t use it for long, or that it breaks fairly quickly after a few uses. It’s not a significant positive feature for this steamer. And for the final differentiating feature, it does include what it calls a small herb box. This allows you to fill it with various herbs or essential oils easily, giving way to a unique smell each time or allowing you to reap the benefits of what you put in. This can make for a more relaxing experience. But the other steam saunas are also compatible with essential oils as well, though perhaps not dried herbs. For cleaning, one person recommended using a mix of lemon and vinegar water along with a standing fan to help it dry out. This seems like an excellent method to clean the sauna. Many buyers find that the materials for this sauna are on the cheap side, even though the sauna is priced on the high end relative to the others on our list. It’s still great at achieving its core functionality overall as a portable home steam sauna, but you should handle it with care if you do decide to go through with this one, and don’t weight the added head cover as having much worth. Tap into the many benefits of a sauna at home or anywhere. Power level 1: 750W, level 2: 1050W - Voltage: 110V - Timer: 10-100min - 2L Water / Dimension: 33" x 29" x 39" - Chair Dimension: 11" x 12" x 24" - Head Cover: 15.5" x 29" x 12"
Steam saunas are great when it comes to relieving muscle pain, clearing your skin, and helping you think clearly in a relaxing, calm environment. Having one for your home can make it easier to hop in whenever you want, as saunas or steam rooms are usually only seen in gym environments and can be expensive to use! While the saunas we reviewed all had merit in one way or another, we found the top two to be SUNCOO’s portable steam sauna as well as Durherm’s. The portable sauna from SUNCOO is extra reinforced, leading to a hotter experience overall. It can also be controlled with a remote control and comes standard with features like zippers for your hands. Durherm’s steam sauna is well built, easy to assemble and disassemble, and overall functions pretty well. No matter which portable sauna you choose, you’ll almost certainly be satisfied with these! You can get all of the benefits of a fully built sauna for a fraction of the price.